Today we’d like to introduce you to Jim and Brandy Gilliam. 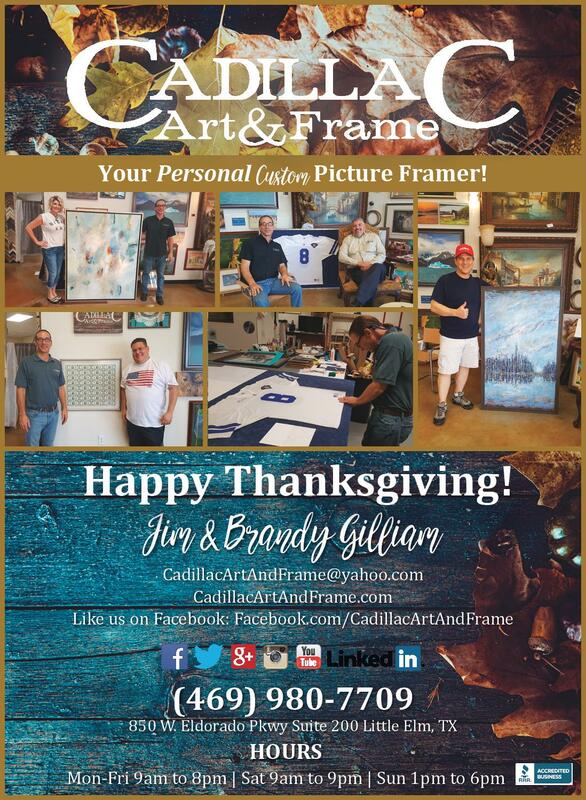 Brandy and Jim run a top notch framing store and is a must see. You will be please you went. You will enjoy learning all the things they do and you can have some pieces of your own which you can bring to them to frame. Custom high end Picture Frame Store and Art Gallery offering painting classes for kids & adults at a stable mid-range price. However we cater to everyone. Customers can find pieces at any price range. Worked at Zach’s (Like a Michaels) from 18 to age 21. Then I bounced from frame shop to frame shop picking up skills, knowledge and experience from other business owners. I have been all over the US and opened over 24 locations for other business owners and ran the business. I always knew the dream was to own my own store. I actually started losing hope in my dream and feared it would not happen. That is until my wife inherited a house which she rented out, which paid for her college education. Handling rental property became a lot of work. She decided to sell it and banked the funds. The biggest blessing is she believed in my dream and wanted to help me establish my dream. So one day she went to the bank and handed me the funds which is how Cadillac art & Frame became a reality. It was so exciting, like the birth of a child. There was a lot of anxiety but when the first customer walked in and had a project for me I soared. It has been long hours with little time off. The opening process, permits, signs, and the number of hours required. Since we opened I have only had a half day off. It also is very demanding on your time. My wife works full time at TWU as a Financial Aid Counselor plus an additional 30 to 35 hours at the business. If you add that to the number of hours I spend here you can see the business takes most of our life at the present. This is to be expected especially in the first three years of a business. They enjoy working with me and know I stand 100% behind my work. They know my aspirations are to be the best framer in the country, I’m compassionate with my work and with my customers. Our customers have written great reviews and return for additional business. I make a point to know the story behind every piece brought in as that is what evokes my artistic allowing me the ability to turn it into a masterpiece with the right matting and frame. There has been a few. I get amazing items brought in. So my most memorable experience since opening is Mr. Tim Yamada. He brought in a regular coat hanger that still had the white paper on it. The hanger had his grandfather’s business logo on the white paper. His grandfather had been in the dry cleaning business. For most of his life and this was the last hanger left of his career. Mr. Yamada has held onto this hanger for 40 years since it held so many memories of his grandfather. He requested a shadow box to display it in so it would stay the same and be able to be handed down through the generations. The project turned out great and has been a memorable experience for me over the span of my career. 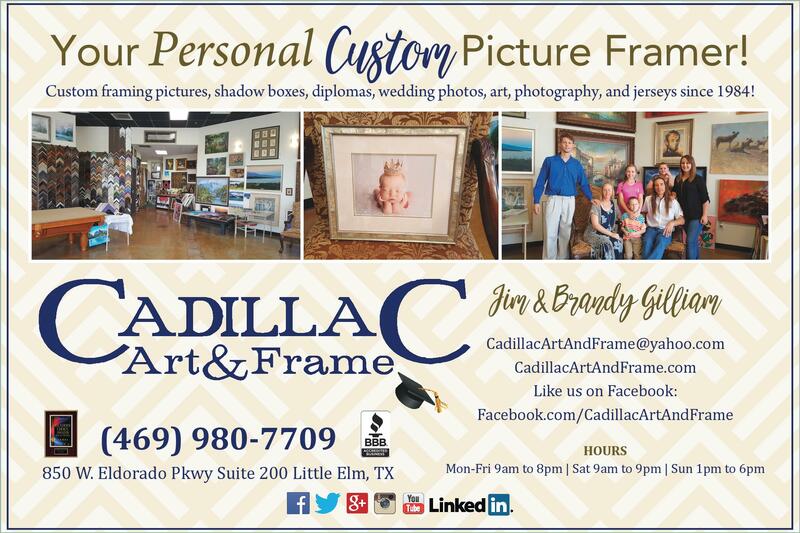 We offer painting classes for kids & adults every week and post the events on our Cadillac Art & Frame Facebook page. The adult classes alternate between a Thursday night and a Friday night from 7-9 P.M. The adult classes are 45.00 per person which includes a canvas & paint. The kid’s classes are every Saturday from 10 A.M. to 11:30 A.M. We have 6 face painters and one balloon artist for an amazing painting birthday party. The kids classes are 35.00 per child from ages 5 to teen which includes canvas & paint. Many have heirlooms tucked away in a box that holds great memories. They are usually shocked when they stop by out of curiosity and we engaged in conversations which leads them to talking about their heirlooms. Once they learn there is a way to protect them forever and allow them to pass it on they run back to get the item. We also have different resources to help you restore pieces, and create a lasting memory. We are working on a project where the gentleman had a small picture of his Mom and wanted it blown up and frame it for his brothers and sisters as a Christmas gift this year. I have three male idols in life. My father (Burton Gilliam) has taught me to dig in and fight for what I think is right. He recently he posted on Facebook how proud he is of me. My Step Dad (Bob Clinger) who is so spiritual, kind and giving. He taught me how to evaluate the big picture and not narrow in so much. Mohamed Ali and not for his fighting accomplishment. He is a man that stands behind his beliefs and value and allows nothing to come behind that. However behind every successful man is a loving, giving and caring Mother. The most important person in my life is my Mom Diane Clinger. She has been my rock and has supported throughout life. I personally want to than my Mom for always believing in me. I am doing what I love and have dreamed about since I was 18. Follow your heart and dream. We are an average family with five children (between the ages of 6 to 23) and believe nothing is impossible. Just as important is to understand that marketing is the key success and connecting to your clients. The residents of Little Elm have been very endearing. They are so down to earth and have welcomed us with open arms! Little Elm beach is a favorite place for the family, eating a hamburger on the lake and getting a snow cone while the kids play in the sand on the beach is priceless!! Most businesses are family owned. Shopping local keeps family businesses afloat and allows Little Elm to thrive. It’s not only convenient but offers so much uniqueness. It builds comradery with the business owners and the residents in order to provide excellent VIP service. 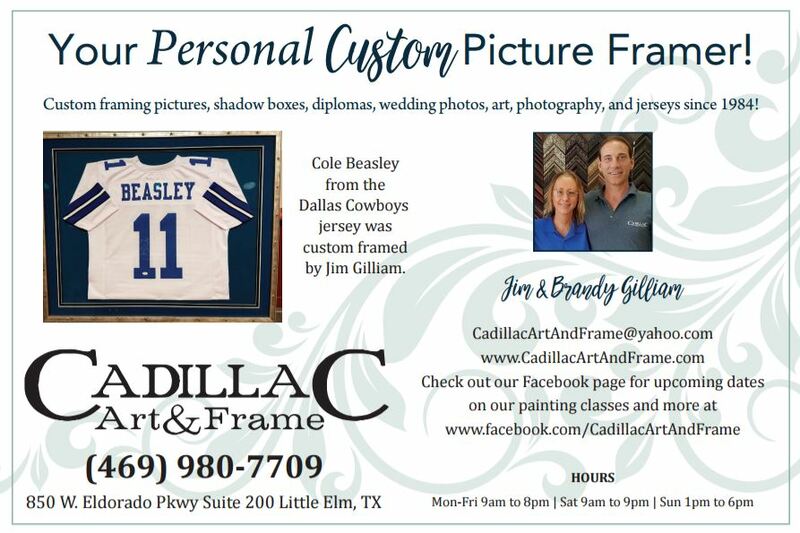 Learning how to market and let customers know we are here and can frame any item in a beautiful custom picture frame. Jim is here seven days a week all day long. We would love to grow our family business and offer jobs in the future to other picture framers in the area. Alright – so let’s talk business. 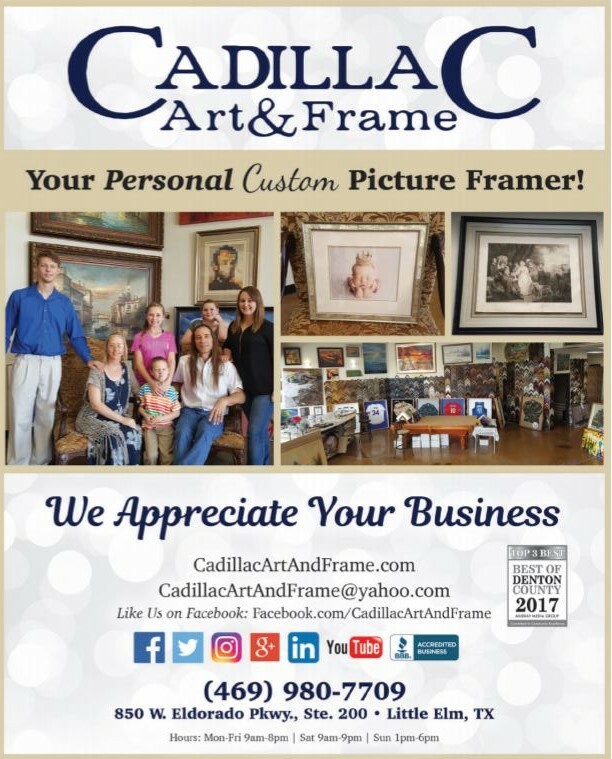 Tell us about Cadillac Art & Frame – what should we know? 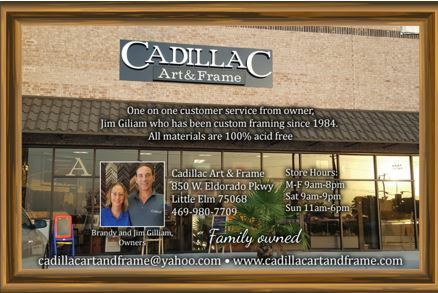 Jim Gilliam has been custom framing pictures, shadow boxes, diplomas, wedding photos, art, photography, and jerseys since 1984. We are very excited to bring our framing expertise and services to Little Elm, TX and other cities in the future. We have a wide variety of selections for custom picture frames, custom framing work and AMAZING art in the Gallery from local artists. Plus freestyle painting for kids, any day, right in the Gallery! Keep your artwork and pictures safe with professional framing, or create a shadow box to display your special mementos. 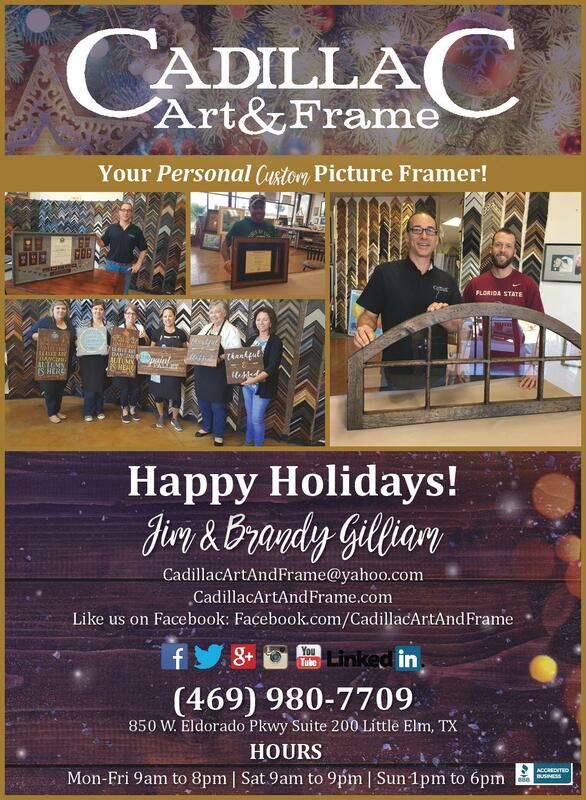 Whatever your framing needs, Cadillac Art & Frame can help. Our family-owned and -operated custom framing shop is dedicated to customer service and satisfaction. We strive to build long-lasting relationships with our customers and take the time to sit down and truly get to know them. We want to hear about your special moments and what they mean to you, and share in your excitement about them. We’re passionate about what we do, and understanding your memories helps us do a better job for you. 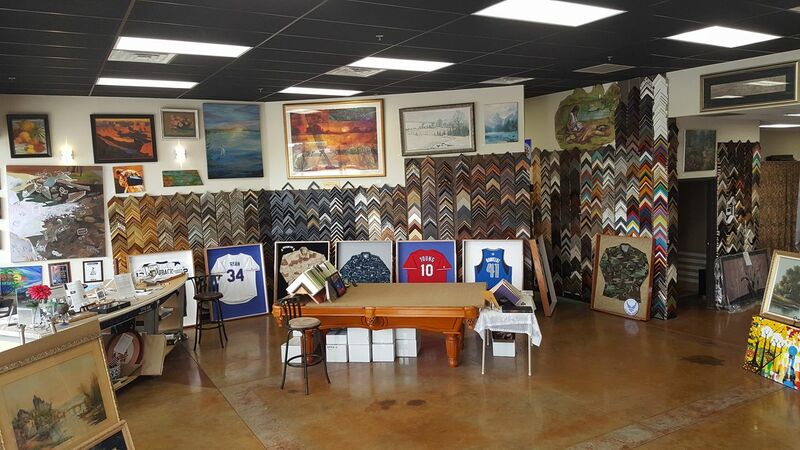 With more than 30 years of custom framing experience, you can rest assured in knowing that we’ll give your items the same level of care and respect that you’ve given them. 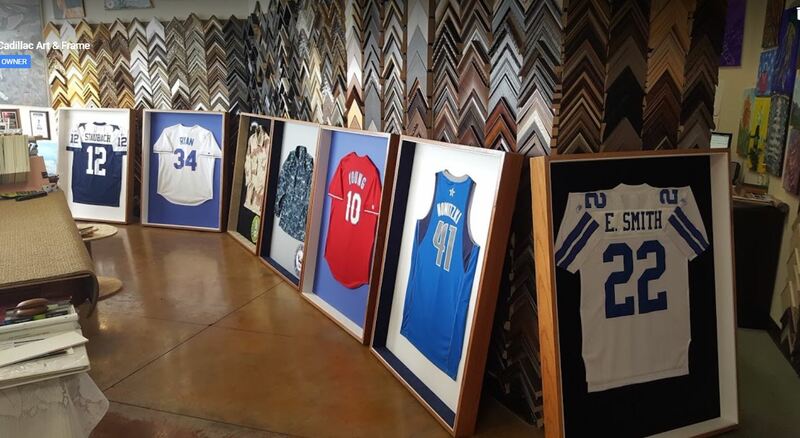 Whether you’ve dropped off a sports jersey to be framed or “baby’s firsts” items for a shadow box, take a few minutes to browse the beautiful art in our gallery. We feature one-of-a-kind pieces from various local artists on consignment and offer freestyle painting for little ones right in the gallery. 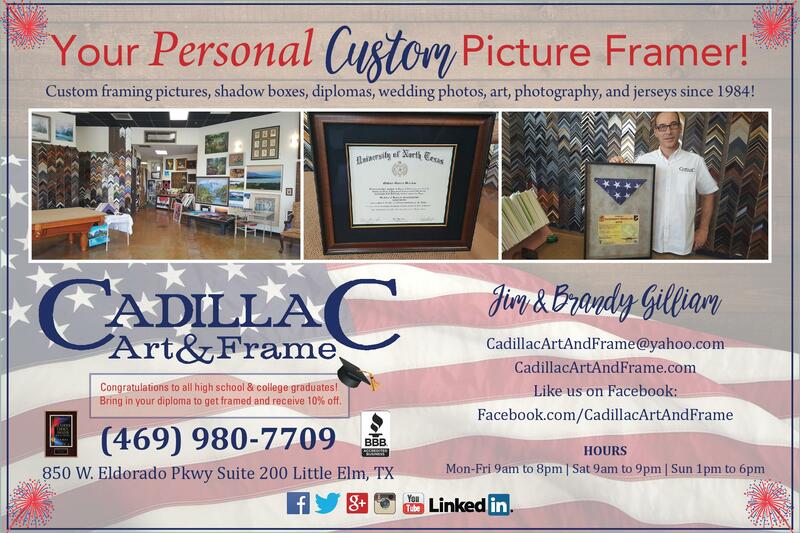 Who knows, maybe we’ll all witness the next Picasso or Michael Angelo right here at Cadillac Art & Frame! Building trust with our clients. Our frames range from $8.00 a square foot to $90.00 a square foot.